The toolbox contains indexes useful for an exposure indication on industrial chemicals in the SPIN database. The indexes are automatic generated and compiled from mostly confidential use information stored in the national product registers in the Nordic countries. SPIN contains use information from several years. The index tools will, however, focus on the current uses and is therefore only applied for the latest updated information. Older data that was published before the index tools was introduced (from 2008) is not fully covered with index information. Four index tools are developed. Use Index: A general emission/exposure estimation chemical of different human and environmental target groups. Range of Use index: Indicates the broadness of the use of a substance in a Nordic country. Article Index: Gives indications if a substance may end up as a part of an article. Quantity Index: Is based on the amount of annually consumed substance. The tools are only recommended for initial screening purposes. For a thorough analysis more data are needed. A first step is then to explore the non-confidential use data available on SPIN. Also specific use data that have been excluded from the SPIN database may be accessible. That normally demands a manual aggregation of data that only can be done at the national Product Registers. – Industrial Category, IC (named “Industrial use” in SPIN). They refer to the downstream use of the product. More than one UC or IC category can be used to describe the use of a product. The specific quantities registered for different uses could be used to balance the contributions for different uses of the same substance. However, since the quantity data in many cases are confidential that should leads to considerable exclusion of unique data from the data set. The Use index gives an indication of the potential “worst case” exposure to different target groups in the society and the environment. The Use Index is based on the use descriptors “Use Category” and “Industrial Category” (see above). Since there are no chemical/physical properties integrated the exposure estimate is limited to the environment near the release source. The index is presented per Nordic country. Worst case assumption: When a substance is used in several uses with different exposure potential, the index for the most critical usages per target group are selected. (more information on the algorithm). 1) Note that registered use descriptors do not include all potential uses of the chemical and the possibility for exposure can therefore not be excluded. Further information can be found by pushing the ‘Help’ tab. The Article Index indicates if a substance is used in production of articles/goods. Each registered product is categorized with use descriptors. The Article Index is based on the use descriptors Use Category” and “Industrial Category” (see above).. The Quantity Index shows the level of the amount of a substance consumed. It is based on the total amount annually registered to the Product Register. Use of articles can in many situations be an important release source for emerging substances. The knowledge of substances that can be found in articles is, however, limited. The Nordic Council of Ministers, Chemical group (NKG) has therefore supported the development of a screening tool for the SPIN database that indicates if a substance occurs in the production of articles/goods. The index is based on use descriptors used in the Nordic Product Registers (for substances and mixture). As for all of the other tools in the SPIN Exposure Toolbox, will the Article Index be applied for the whole data set, including the confidential part. The information of Use Category (UC) and Industry Category (IC) for a product is used to identify the possibility for the substances to be used in the production of articles. The quantity of the substance used in a product can be used to balance the contributions from different uses (of the same substance) into an Article Index (covering all individual uses). The index will then indicate an average situation on the national market. A disadvantage with a quantity balance index is that relatively small, but critical article use, will then be diminished. By excluding the quantity, the index gives all uses the same weight. This worst case approach is expected to be of the most interest for a risk assessor when looking for critical exposures. Further, an exclusion of the weight keeps the calculation of the index simple and transparent. The Article Index on SPIN is therefore not included the quantity in the algorithm. A quantity balanced index can, however, be of interest for the identification of dominating release sources (e.g. in national screening monitoring). Such a complementing article index will therefore be considered in future development of the SPIN Exposure Toolbox. Each IC and UC code has ones been categorised into one of three article use categories, indicating different levels of possibility for a substance to be used in an article producing industry. Each category has been assigned an “Article Number” (AN, see Table 1) that is used in the index algorithm. The category specific AN values are published is the “Download area” at the SPIN website. Table 1: Criteria and Article number for the three categories. Table 2: Explanation of abbreviations. For some of product uses it is obvious, based on one of the descriptors, that the substance will not end up in an article, even if the other descriptor shows a high indication of “article production” (e.g. detergent to be used in plastic production). To handle such a misleading code combinations a multiplication is used in the algorithm. By giving all such “absolute” categories the value zero, the article index for these products will then always end up with a “0”. Table 3: Article Index categories and criteria which are applied on the SPIN database. The Nordic substance register database (SPIN) contains non confidential use information on chemical substances extracted from national product Registers in the Nordic countries. National legislations in the Nordic countries require manufacturers and importers to declare chemical substances and products to the national product register. The registration obligations do not apply to foodstuffs, cosmetics, medicinal products and quantities less than 100 kg/year per company. The product related information contained in the product registers includes data on technical function, industrial area of use, composition of the chemical products, the quantities that are placed on the market and some other information about the product. A large part of the information contained in the national registers is classified as confidential. With regard to exposure related information it is estimated that around 70-75 % of all information is not public available. Use Index is a method where confidential use information is converted into an exposure based index that can be made public available. The development of Use Index was initiated because of the increasing demand for information on exposure to be used under the REACH legislation. Information on exposure plays an important role in the REACH legislation. The registrant may waive testing on certain endpoints (e.g. toxicity, persistence etc) if uses of the chemical does not result in significant exposure in a member state of the European Union. Under REACH, use information is required to be submitted along with the registration of the chemical. However, the Nordic Product Registers contain information that is not available from the registrations under REACH (for a more comprehensive comparison on exposure information contained in the two systems see Ahrens & Reihlen 2007). This highlights the need to develop a method that can convert the confidential data on exposure contained in SPIN to easily accessible information. As an indication for registrants (manufacturers and importers) on uses of their chemicals by downstream users that may result in exposure. As a check tool for ECHA and national competent authorities when assessing a request for e.g. waiving of tests. As a screening tool for priorization. It must be emphasized that Use Index cannot be used to provide exact quantifications on exposure. Use Index should rather be considered as an indicative screening tool. In order to obtain sufficient information on exposure to be used in waiving of tests or risk assessment a much more thoroughly assessment of potential or known uses must be undertaken that is outside the scope of Use Index. Certain product types that may contribute significantly to overall exposure are insufficiently represented in SPIN (e.g. articles such as toys, food packaging materials, cosmetic products, medicinal products). Use Index considers only direct exposure. Indirect exposure, e.g. exposure of man via the environment or exposure to the environment through waste disposal is not included. In regard to human exposure (included occupational and consumer) there might be a underestimation of exposure regarding to mechanical work ( ex. hand-mixing, hot work operations, high (mechanical) energy work-up of substances bound in materials and/or articles, open processing and transfer of minerals at elevated temperature. The development of Use Index was sponsored by NPG and carried out by a project group consisting of 1-3 people from each of the Nordic chemical authorities. It was decided to employ a bottom-up iterative process where each country prepared a Use Index from a common template. These were later compared and inconsistencies were identified and discussed in order to reach a common understanding. It is very important to note that Use Index reflects the combined knowledge of the project group regarding general potential exposures. This may have caused a bias since members of the project group have more experience in assessment of certain types of uses than they have with other types of uses. It was therefore decided to make the assigned exposure indices and algorithm public available in order to increase transparency and allow readers to make their own judgement of the exposure indication applied for the different recipients. Links to the exposure indices are found in annex A while information on algorithms is included in the materials & methods section. The Use Index focuses on the diffuse dispersal of chemicals, principally chemical products/mixtures. Chemical product is understood here as meaning a substance or a preparation/mixture of chemical substances. Diffuse emission of chemicals may also take place from articles. The Product Register does not contain any direct data on articles. The data can, however, be reasonably established indirectly as raw materials for articles are generally chemical products. Article here is understood to mean an article which is treated with/manufactured from a chemical product. An example, to clarify the difference between article and product, is that plastic raw material is notifiable to the Product Register but if the raw material was instead to be shaped into a plastic seat, the seat would not be notifiable even though it consists of exactly the same components. With regard to chemicals which can be predicted to be built into articles with a long life, such as building materials, estimates of exposure have been made so that they cover all the different stages in the life-cycle of the chemical through to waste management. A weakness in this context is that articles consumed in a Nordic country are only partially made in the country. Each chemical product reported to the Product Register has been allocated at least one Use Category and at least one Industrial Category. These categories provide information on how the product is used and handled. Exposure estimates have been made on the basis of these two categories in the form of the parameters Use Exposure Number and Industrial Exposure Number. All the use categories in the Product Register have been allocated a Use Exposure Number (“low”, “medium”, “high”) for six primary recipients (see below). Similarly, each industrial category is allocated an Industrial Exposure Number for the primary recipient concerned. The algorithm for the calculation of Use Index is presented in figure 1. The Use Exposure Number and Industrial Exposure Number provide a base for the calculation of the Use Index. The Use Exposure Number is a manual estimate of the intrinsic emission potential of the chemical product based on how it is used. The Industrial Exposure Number is a manual estimate of the geographical dispersal of a chemical product depending on where it is used and by whom. The definition of Use Exposure Number and Industrial Exposure Number somewhat overlap each other. The potential of exposure is estimated for all substances in the SPIN database. The result is presented in the form of a Use Index for each substance. The Use Index of a chemical estimates the “worst case” of a primary recipient being exposed to the chemical for a specific year. All the information is stored in the different national Product Registers at product level. Information about a product is further broken down into the substances contained, using the chemical composition of the product. For those substances that are contained in several products, the product that has the highest Use Index will be selected and presented on the SPIN web site (“Worst case”). The reporting company must state the use function or functions the product has on the product report form. This is done by entering one or more use categories. The Use Category codes, with associated textual description, are indicated in a Use category list (see under “Codes” in the Guide). New use category codes (UCN1) for all products were introduced with effect from 2002. The reason why this was done was the need to harmonise the codes between the product registers of the Nordic countries. As well as a general re-grouping of the codes, the resolution for the group of paints, inks and glues was increased. The number of codes was consequently expanded in comparison with previous years. At least one Industrial category is given for each product. These Industrial categories show what branch or branches the product is used in or transferred to. The industrial categories consist of a selection of codes (see under “Codes” in the Guide/) taken from National Standards of Industrial Classification which is based on the European SIC (Standard Industrial Classification; old name “NACE”) code system. To make the Use Index a usable tool when searching for substances in different parts of society and the environment, exposure calculations have been performed in parallel for six different recipients/target groups. These have been chosen on the basis of the most common pathways for dispersal of chemicals from society. Use Index is intended to reflect the direct exposure to the six primary recipient’s “soil”, “air”, “surface water”, “sewage treatment plant” (STP) “consumer” and “occupational”. The term primary is added in order to underline that it concerns exposure to environmental compartments close to the points of emission. Physico-chemical properties are not integrated into the exposure algorithm, mainly since it is not available for all the substances in the product registers. This limited the exposure estimate to the near surroundings. Physico-chemical properties has, however, indirectly been integrated in the exposure categorisation when the function code of a product gives an indication of inherent properties of the substances (eg solvent based product-high vapour pressure; detergents-high water solubility). In order to estimate distribution to recipients further away from the points of emission, one has to consider physico-chemical parameters as well as information on environmental transformation and bioaccumulation. This is outside the scope of this index. However, it is possible to carry out manually indicative estimations on a case to case basis. An example is when Use Index indicates a high potential for exposure to STP but low direct exposure to soil or surface water. In this case it would be reasonable to assess whether further dispersal to other environmental compartments would be likely based on the chemical profile. “Surface water” relates to the direct emission to surface water. Relevant for example as a primary recipient for chemical products used in or in the proximity of lakes/seas, or used in industrial plants that are likely to have separate discharge systems (i.e. not connected to municipal sewage treatment plants). “Soil” relates to the direct emission to land/soil. It is relevant as a primary recipient for chemical products used outdoors, in particular close to the ground. It may also be relevant for chemical products transported or stored in such a way that leakage may occur. “Air” relates to direct emission to air. It focuses mainly on outdoor use. Indoor air is used when the release is such that it can be expected to continue outdoors. If the emission stays indoors, it instead counts as “Human” (see below), and/or as “Sewage Treatment Plant” (see below) if it finally ends up in wastewater. “STP” relates to direct releases to wastewater which is connected to a municipal sewage treatment plant. It mainly focuses on “indoor uses”. Industrial operation with wastewater discharges are included if it is likely that it is connected to a municipal sewage treatment plant. If the industrial plant has its own treatment plant which is considered to be substantially worse than a municipal one, surface water is the relevant primary recipient instead. Relates to dispersal that causes direct exposure of humans during occupational uses. Occupational exposure is here regarded as marginal if the number of persons exposed can be regarded as relatively small in comparison with the number of persons exposed during the consumption phase. Inhalation is here assumed to be the dominant uptake route. Relates to dispersal that causes direct exposure to consumers during consumption of products. As for the consumer exposure is inhalation assumed to be the dominant uptake route. The following principles have been applied in the manual estimation of exposure for the various use categories. The use categories that have been harmonized within the Nordic countries (UCN) are used for the index. The product’s technical function – The use category “herbicides”, for example, indicates a high emission potential to soil while “biocidal products for human use” points to a high human exposure. Focus on chemical substances contained – Use Exposure Numbers have been allocated on the basis of the chemical substances contained in products with a certain Use category. A high proportion of volatile substances for example give a high Use Exposure Number to air. Lifetime emission – The whole lifecycle of the chemical product has been taken into account in the estimation of exposure, from manufacturing until it is disposed of at the stage of waste management (including as part of an article). As a guideline in manual exposure estimation, the concept of “lifetime emission” has been defined as how large a proportion of the chemical product is missing when the product/article is disposed of at the waste management stage. The part which does not remain when the product becomes waste has been dispersed to society or the environment. 0-5% lifetime emission (at least 95% is disposed of at the waste stage) has given the Use Exposure Number “low”, 5-50% lifetime emission has given the Use Exposure Number “medium” and a lifetime emission greater than 50% has given the Use Exposure Number “high”. The following principles have been applied in the manual estimation of exposure for the various industrial categories. Focus on diffuse emission – Two clear groups can be distinguished among the industrial categories of the Product Register. These are manufacture/trade of chemical products. Large manufacturing industry is a typical point source of emissions, and these industrial categories have generally been allocated a low Industrial Exposure Number. Trading in chemical products in general and retailing in particular indicates that the chemical product may lead to diffuse emissions. These industrial categories have generally been allocated high Industrial Exposure Numbers. Number of installations or handling sites – The industrial categories that indicate that the chemical product is used or handled in a limited number of places in the country (for example particular manufacturing industry) have been allocated low Industrial Exposure Numbers, while the industrial categories that indicate widespread use at many places (for example servicing of motor vehicles) have been allocated high Industrial Exposure Numbers. Number of persons involved – The same approach as for “number of installations and handling sites”. If many persons handle a chemical product (for example retail trade in paints), there is great potential for uncontrolled release, and this results in a high Industrial Exposure Number. If the number of users, on the other hand, is limited (for example manufacturing industry), the industrial category is allocated a low Industrial Exposure Number. Auxiliary chemicals/Chemicals that live on in another product/article – The substances registered under a particular industrial category have been studied in connection with the allocation of Industrial Exposure Numbers. Industrial categories which have a large proportion of auxiliary chemicals (for example food and beverage industry, where most chemical products used are detergents) have been allocated a low Industrial Exposure Number as they are primarily judged to give rise to point emissions. For industrial categories where used products are expected to live on in other products or articles, and consequently lead to diffuse dispersal, higher Industrial Exposure Numbers have been allocated. Municipal or own sewage treatment – Consider if the industry has their own treatment plants or are connected to municipal sewage treatment plants. In-house treatment results in surface water as a primary recipient, while municipal treatment results in STP. With humans as the primary recipient/target group, the estimation of exposure becomes slightly different from the other recipients/target groups. The principle difference is that the quantitative levels have been set lower (see the criteria above). Additional for the two human target groups are that the size of the exposed populations has been weighted. A big population is able to e.g. elevate the exposure estimate one or several levels. This means that “human” target groups (occupational and consumer) are not directly comparable with the “environmental” primary recipients. In case of human target group, the estimation of exposure is based on the fact that it is a direct exposure. The potential of exposure is assumed to be dominated by inhalation. Other ways of exposure are therefore not considered (skin, oral). Humans may be exposed as consumers or due to occupational use (includes industrial and professional use). Occupational exposure comprises direct exposure where it is assumed that personal protective equipment (PPE) is not used. It is impossible to predict the actual use of PPE as it is based on individual responsibilities and habits. For consumers there will also be direct exposure, but both the duration and amount of exposure will normally be lower than for occupational use. “High”: Handling the substance involves direct intentional exposure to whole body or parts of the body. “Medium”: Handling the substance involves an immediate risk of an unintentional exposure to the body or body parts. “Low”: Handling the substance only involves a low risk of an unintentional exposure to the body or body parts. The ability of a substance to become airborne. Influencing factors are conditions such as physical form, temperature (ex. hot work operations), pressure and mechanical processing. Chemical properties are, however, not included. The way the substance is used. Influencing factors are the degree of manual handling, proximity to the source and indoor/outdoor handling. Barriers to control exposure and prevent substance becoming airborne in the workplace (open /closed process). Occupational use comprises here only the direct exposure, where it is assumed that personal protective equipment (PPE) is not used. The use of exposure modifiers such as use of local exhaust ventilation is not included. “High”: Handling of the substance involves direct exposure by inhalation in an open process. The distance from source is < 1 m.
High degree of mechanical work. Ex. hand-mixing, hot work operations, high (mechanical) energy work-up of substances bound in materials and/or articles, open processing and transfer of minerals at elevated temperature. Partly open process (use in batch and other process where opportunity for exposure exist). The distance from source is ≥ 1 m (medium degree of mechanical work; potentially closed operations with minerals at elevated temperature; low energy manipulation of substances bound in materials and/or articles). Closed process (use in closed batch process; synthesis or formulation). Low degree of mechanical work. A download of the total UseIndex-tables is available here or at the downloadpage. The knowledge of used quantity of a substance is critical for estimation of its release & exposure. The Nordic product registers contain detailed product quantifications, but most of it is classified as confidential. One way to made quantity data public available is to aggregate the data. In this quantity index, the quantities from all product uses are added to a total quantity and grouped into a number of quantity groups. One main use of the index is as a tool for priority of risk management work. Substances which only are registered in one country can be expected to occur also in the other Nordic countries. One important reason is differences between the national registrations rules. Comparisons of the QI between different countries may therefore be necessary. The quantity index has therefore been normalized against the population size (quantity per inhabitants). Another advantage with normalization is that it makes it more useful for substance prioritization on an international level. As for the other tools in the SPIN Exposure Toolbox, will the Quantity Index be applied for the whole data set in each product register, including the confidential part. Further, the QI will only be presented per Nordic country. the categorisation of products as “imported”, “exported” and “produced”. As all other SPIN Exposure tools, is the QI calculated per Nordic country. An aggregated QI for all Nordic countries is not possible to create, mainly due to the limitation in the handling of confidential data. The following algorithm is suggested as a starting point for the workshop. The origin is a Quantity index, developed for the Swedish product Register (mainly for internal priority activities). Table 1: The population sizes used for the normalization of the Nordic Quantity Index. The potentially confidential QIsubst. x, national will finally be transformed into a non-confidential QI category by the categorisations in table 2. Table 2: Quantity Index categories (to be presented in the background information text in the SPIN Exposure Toolbox). * Algorithm: production + import – export ( tonnage for all products per Nordic country). Table 3: Explanation table for the Quantity Index categories for the pop up “explanation” in the SPIN Exposure Toolbox. Each chemical product reported to the Product Register has been allocated at least one Use Category and at least one Industrial Category. These categories provide information on how the product is used and handled. Exposure estimates have been made on the basis of these two categories in the form of the parameters Use Exposure Number and Industrial Exposure Number. All the use categories in the Product Register have been allocated a Use Exposure Number(“low”, “medium”, “high”) for six primary recipients (see below). Similarly, each industrial category is allocated an Industrial Exposure Number for the primary recipient concerned. The algorithm for the calculation of Use Index is presented in figure 1. Focus on diffuse emission – Two clear groups can be distinguished among the industrial categories of the Product Register. These are manufacture/trade of chemical products. Large manufacturing industry is a typical point source of emissions, and these industrial categories have generally been allocated a lowIndustrial Exposure Number. Trading in chemical products in general and retailing in particular indicates that the chemical product may lead to diffuse emissions. These industrial categories have generally been allocated high Industrial Exposure Numbers. The knowledge of used quantity of a substance is critical for estimation of its release & exposure. The Nordic product registers contain detailed product quantifications, but most of it is classified as confidential. The Quantity Index make it possible to transform the confidential tonnage data by (i) aggregate the different use specific tonnage into a total tonnage and (ii) classify it into tonnage bands. Bands covering two orders of magnitude are considered to be wide enough for this purpose. Normally is the exported volumes considered to be the most confidential part of a national product register. However, exported quantities are excluded from SPIN, since the index focus on the national consumption. In the Quantity Index, the quantities from all product uses are added to a total quantity and grouped into a number of quantity groups. One main use of the index is as a tool for priority of risk management work. Substances which only are registered in one country can be expected to occur also in the other Nordic countries. One important reason is differences between the national registrations rules. The quantity index has therefore been normalized (based on population size) to make it more comparable. The Quantity Index is based on data in the Nordic Product Registers (for substances and mixture). As for all of the other tools in the SPIN Exposure Toolbox, is the Quantity Index applied for the whole data set, including the confidential part. The concentration of the substance in different registered products. The quantity of the products containing the substance. The potentially confidential QIsubst. x, national is finally transformed into a non-confidential QI category by the categorisations in table 2 (equation 6). The tools are only recommended for initial screening purposes. For a thorough analysis more data are needed. A first step is then to explore the non-confidential use data available on SPIN. Also specific use data that have been excluded from the SPIN database may be accessible. That normally demands a manual aggregation of data that only can be done at the national Product Registers. All index tools except the Quantity Index are based on the two main use descriptors: – Use Category, UC. – Industrial Category, IC (named “Industrial use” in SPIN). They refer to the downstream use of the product. More than one UC or IC category can be used to describe the use of a product. The specific quantities registered for different uses could be used to balance the contributions for different uses of the same substance. However, since the quantity data in many cases are confidential that should leads to considerable exclusion of unique data from the data set. The Use index gives an indication of the potential “worst case” exposure to different target groups in the society and the environment. The Use Index is based on the use descriptors “Use Category” and “Industrial Category” (see above). Since there are no chemical/physical properties integrated the exposure estimate is limited to the environment near the release source. The index is presented per Nordic country. Worst case assumption: When a substance is used in several uses with different exposure potential, the index for the most critical usages per target group are selected. Use of articles can in many situations be an important release source for emerging substances. The knowledge of substances that can be found in articles is, however, limited. The Nordic Council of Ministers, Chemical group (NKG) has therefore supported the development of a screening tool for the SPIN database that indicates if a substance occurs in the production of articles/goods. The index is based on use descriptors used in the Nordic Product Registers (for substances and mixture). As for all of the other tools in the SPIN Exposure Toolbox, will the Article Index be applied for the whole data set, including the confidential part. The information of Use Category (UC) and Industry Category (IC) for a product is used to identify the possibility for the substances to be used in the production of articles. The quantity of the substance used in a product can be used to balance the contributions from different uses (of the same substance) into an Article Index (covering all individual uses). The index will then indicate an average situation on the national market. A disadvantage with a quantity balance index is that relatively small, but critical article use, will then be diminished. By excluding the quantity, the index gives all uses the same weight. This worst case approach is expected to be of the most interest for a risk assessor when looking for critical exposures. Further, an exclusion of the weight keeps the calculation of the index simple and transparent. The Article Index on SPIN is therefore not included the quantity in the algorithm. A quantity balanced index can, however, be of interest for the identification of dominating release sources (e.g. in national screening monitoring). Such a complementing article index will therefore be considered in future development of the SPIN Exposure Toolbox. Each IC and UC code has ones been categorised into one of three article use categories, indicating different levels of possibility for a substance to be used in an article producing industry. Each category has been assigned an “Article Number” (AN, see Table 1) that is used in the index algorithm. The category specific AN values are published is the “Download area” at the SPIN website. Table 1: Criteria and Article number for the three categories. For some of product uses it is obvious, based on one of the descriptors, that the substance will not end up in an article, even if the other descriptor shows a high indication of “article production” (e.g. detergent to be used in plastic production). To handle such a misleading code combinations a multiplication is used in the algorithm. By giving all such “absolute” categories the value zero, the article index for these products will then always end up with a “0”. Table 3: Article Index categories and criteria which are applied on the SPIN database. The development of Use Index was sponsored by NPG and carried out by a project group consisting of 1-3 people from each of the Nordic chemical authorities. It was decided to employ a bottom-up iterative process where each country prepared a Use Index from a common template. These were later compared and inconsistencies were identified and discussed in order to reach a common understanding. It is very important to note that Use Index reflects the combined knowledge of the project group regarding general potential exposures. This may have caused a bias since members of the project group have more experience in assessment of certain types of uses than they have with other types of uses. It was therefore decided to make the assigned exposure indices and algorithm public available in order to increase transparency and allow readers to make their own judgement of the exposure indication applied for the different recipients. Links to the exposure indices are found in annex A while information on algorithms is included in the materials & methods section. The Use Index focuses on the diffuse dispersal of chemicals, principally chemical products/mixtures. Chemical product is understood here as meaning a substance or a preparation/mixture of chemical substances. Diffuse emission of chemicals may also take place from articles. The Product Register does not contain any direct data on articles. The data can, however, be reasonably established indirectly as raw materials for articles are generally chemical products. Article here is understood to mean an article which is treated with/manufactured from a chemical product. An example, to clarify the difference between article and product, is that plastic raw material is notifiable to the Product Register but if the raw material was instead to be shaped into a plastic seat, the seat would not be notifiable even though it consists of exactly the same components. With regard to chemicals which can be predicted to be built into articles with a long life, such as building materials, estimates of exposure have been made so that they cover all the different stages in the life-cycle of the chemical through to waste management. A weakness in this context is that articles consumed in a Nordic country are only partially made in the country. Each chemical product reported to the Product Register has been allocated at least one Use Category and at least one Industrial Category. These categories provide information on how the product is used and handled. Exposure estimates have been made on the basis of these two categories in the form of the parameters Use Exposure Number and Industrial Exposure Number. All the use categories in the Product Register have been allocated a Use Exposure Number (“low”, “medium”, “high”) for six primary recipients (see below). Similarly, each industrial category is allocated an Industrial Exposure Number for the primary recipient concerned. The algorithm for the calculation of Use Index is presented in figure 1. 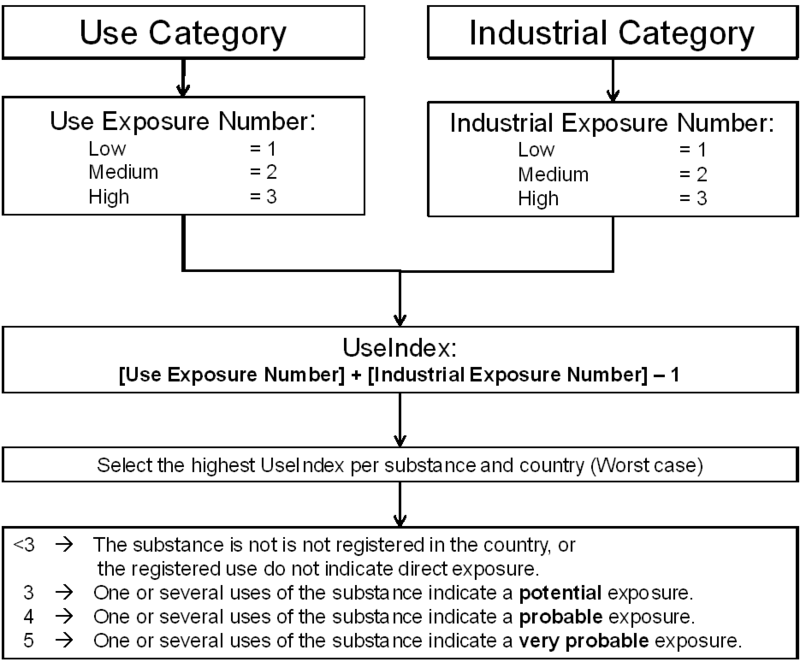 Figure 1: The principle for calculation of Use Index for a substance for a primary recipient http://spin2000.net/wp-content/uploads/2018/06/calc_princip_pic-8.png The Use Exposure Number and Industrial Exposure Number provide a base for the calculation of the Use Index. The Use Exposure Number is a manual estimate of the intrinsic emission potential of the chemical product based on how it is used. The Industrial Exposure Number is a manual estimate of the geographical dispersal of a chemical product depending on where it is used and by whom. The definition of Use Exposure Number and Industrial Exposure Number somewhat overlap each other. The potential of exposure is estimated for all substances in the SPIN database. The result is presented in the form of a Use Index for each substance. The Use Index of a chemical estimates the “worst case” of a primary recipient being exposed to the chemical for a specific year. All the information is stored in the different national Product Registers at product level. Information about a product is further broken down into the substances contained, using the chemical composition of the product. For those substances that are contained in several products, the product that has the highest Use Index will be selected and presented on the SPIN web site (“Worst case”). The reporting company must state the use function or functions the product has on the product report form. This is done by entering one or more use categories. The Use Category codes, with associated textual description, are indicated in a Use category list (see under “Codes” in the Guide). New use category codes (UCN1) for all products were introduced with effect from 2002. The reason why this was done was the need to harmonise the codes between the product registers of the Nordic countries. As well as a general re-grouping of the codes, the resolution for the group of paints, inks and glues was increased. The number of codes was consequently expanded in comparison with previous years. To make the Use Index a usable tool when searching for substances in different parts of society and the environment, exposure calculations have been performed in parallel for six different recipients/target groups. These have been chosen on the basis of the most common pathways for dispersal of chemicals from society. Use Index is intended to reflect the direct exposure to the six primary recipient’s “soil”, “air”, “surface water”, “sewage treatment plant” (STP) “consumer” and “occupational”. The term primary is added in order to underline that it concerns exposure to environmental compartments close to the points of emission. Physico-chemical properties are not integrated into the exposure algorithm, mainly since it is not available for all the substances in the product registers. This limited the exposure estimate to the near surroundings. Physico-chemical properties has, however, indirectly been integrated in the exposure categorisation when the function code of a product gives an indication of inherent properties of the substances (eg solvent based product-high vapour pressure; detergents-high water solubility). In order to estimate distribution to recipients further away from the points of emission, one has to consider physico-chemical parameters as well as information on environmental transformation and bioaccumulation. This is outside the scope of this index. However, it is possible to carry out manually indicative estimations on a case to case basis. An example is when Use Index indicates a high potential for exposure to STP but low direct exposure to soil or surface water. In this case it would be reasonable to assess whether further dispersal to other environmental compartments would be likely based on the chemical profile. The following principles have been applied in the manual estimation of exposure for the various use categories. The use categories that have been harmonized within the Nordic countries (UCN) are used for the index. The product’s technical function – The use category “herbicides”, for example, indicates a high emission potential to soil while “biocidal products for human use” points to a high human exposure. Focus on chemical substances contained – Use Exposure Numbers have been allocated on the basis of the chemical substances contained in products with a certain Use category. A high proportion of volatile substances for example give a high Use Exposure Number to air. Lifetime emission – The whole lifecycle of the chemical product has been taken into account in the estimation of exposure, from manufacturing until it is disposed of at the stage of waste management (including as part of an article). As a guideline in manual exposure estimation, the concept of “lifetime emission” has been defined as how large a proportion of the chemical product is missing when the product/article is disposed of at the waste management stage. The part which does not remain when the product becomes waste has been dispersed to society or the environment. 0-5% lifetime emission (at least 95% is disposed of at the waste stage) has given the Use Exposure Number “low”, 5-50% lifetime emission has given the Use Exposure Number “medium” and a lifetime emission greater than 50% has given the Use Exposure Number “high”. The following principles have been applied in the manual estimation of exposure for the various industrial categories. Focus on diffuse emission – Two clear groups can be distinguished among the industrial categories of the Product Register. These are manufacture/trade of chemical products. Large manufacturing industry is a typical point source of emissions, and these industrial categories have generally been allocated a low Industrial Exposure Number. Trading in chemical products in general and retailing in particular indicates that the chemical product may lead to diffuse emissions. These industrial categories have generally been allocated high Industrial Exposure Numbers. Number of installations or handling sites – The industrial categories that indicate that the chemical product is used or handled in a limited number of places in the country (for example particular manufacturing industry) have been allocated low Industrial Exposure Numbers, while the industrial categories that indicate widespread use at many places (for example servicing of motor vehicles) have been allocated high Industrial Exposure Numbers. Number of persons involved – The same approach as for “number of installations and handling sites”. If many persons handle a chemical product (for example retail trade in paints), there is great potential for uncontrolled release, and this results in a high Industrial Exposure Number. If the number of users, on the other hand, is limited (for example manufacturing industry), the industrial category is allocated a low Industrial Exposure Number. Auxiliary chemicals/Chemicals that live on in another product/article – The substances registered under a particular industrial category have been studied in connection with the allocation of Industrial Exposure Numbers. Industrial categories which have a large proportion of auxiliary chemicals (for example food and beverage industry, where most chemical products used are detergents) have been allocated a low Industrial Exposure Number as they are primarily judged to give rise to point emissions. For industrial categories where used products are expected to live on in other products or articles, and consequently lead to diffuse dispersal, higher Industrial Exposure Numbers have been allocated. Municipal or own sewage treatment – Consider if the industry has their own treatment plants or are connected to municipal sewage treatment plants. In-house treatment results in surface water as a primary recipient, while municipal treatment results in STP. With humans as the primary recipient/target group, the estimation of exposure becomes slightly different from the other recipients/target groups. The principle difference is that the quantitative levels have been set lower (see the criteria above). Additional for the two human target groups are that the size of the exposed populations has been weighted. A big population is able to e.g. elevate the exposure estimate one or several levels. This means that “human” target groups (occupational and consumer) are not directly comparable with the “environmental” primary recipients. In case of human target group, the estimation of exposure is based on the fact that it is a direct exposure. The potential of exposure is assumed to be dominated by inhalation. Other ways of exposure are therefore not considered (skin, oral). Humans may be exposed as consumers or due to occupational use (includes industrial and professional use). Occupational exposure comprises direct exposure where it is assumed that personal protective equipment (PPE) is not used. It is impossible to predict the actual use of PPE as it is based on individual responsibilities and habits. For consumers there will also be direct exposure, but both the duration and amount of exposure will normally be lower than for occupational use. Occupational use comprises here only the direct exposure, where it is assumed that personal protective equipment (PPE) is not used. The use of exposure modifiers such as use of local exhaust ventilation is not included. The following criteria for exposure potential for occupational use have been used: “High”: Handling of the substance involves direct exposure by inhalation in an open process. Ahrens A. and Reihlen A. (2007). The Nordic Product Registers and the future REACH substance database. TemaNord 2007:512. ISBN 978-92-893-1459-6 A download of the total UseIndex-tables is available here or at the downloadpage. 1 “Use Categories Nordic”. The knowledge of used quantity of a substance is critical for estimation of its release & exposure. The Nordic product registers contain detailed product quantifications, but most of it is classified as confidential. One way to made quantity data public available is to aggregate the data. In this quantity index, the quantities from all product uses are added to a total quantity and grouped into a number of quantity groups. One main use of the index is as a tool for priority of risk management work. Substances which only are registered in one country can be expected to occur also in the other Nordic countries. One important reason is differences between the national registrations rules. Comparisons of the QI between different countries may therefore be necessary. The quantity index has therefore been normalized against the population size (quantity per inhabitants). Another advantage with normalization is that it makes it more useful for substance prioritization on an international level. As for the other tools in the SPIN Exposure Toolbox, will the Quantity Index be applied for the whole data set in each product register, including the confidential part. Further, the QI will only be presented per Nordic country. The following algorithm is suggested as a starting point for the workshop. The origin is a Quantity index, developed for the Swedish product Register (mainly for internal priority activities). The QI is based on the tonnage of the “total use” of a specific substance registered as chemical product in a national Product Register. Total use for a specific substance, Qtotalsubst. x, national, is here defined as: Qtotalsubst.x, national [tonnes/year] = Qtotalsubst.x, imported + Qtotalsubst.x, produced – Qtotalsubst.x, exported (1) Qtotalsubst.x, imported [tonnes/year] = ∑ Qsubst.x in all imported products registered for a specific year (2) Qtotalsubst.x, produced [tonnes/year] = ∑ Qsubst. x in all produced products registered for a specific year (3) Qtotalsubst.x, exported [tonnes/year] = ∑ Qsubst.x in all exported products registered for a specific year (4) To make the QI more comparable between the different Nordic countries the index is normalized against the population size with an national specific normalization factor ( see table 1): Qtotal-norm. subst. x, national [normalized tonnes/year] = [Normalization factor] * Qtotalsubst. x, national (5) Table 1: The population sizes used for the normalization of the Nordic Quantity Index. The potentially confidential QIsubst. x, national will finally be transformed into a non-confidential QI category by the categorisations in table 2. Qtotal-norm.subst. x, national [normalized tonnes/year] à [table 2] à QIsubst. x, national (6) Table 2: Quantity Index categories (to be presented in the background information text in the SPIN Exposure Toolbox). * Algorithm: production + import – export ( tonnage for all products per Nordic country). Table 3: Explanation table for the Quantity Index categories for the pop up “explanation” in the SPIN Exposure Toolbox. The Nordic product registers use the NACE (the statistical classification of economic activities in the European Community which was also embodied in the EEA Agreement by the EFTA countries) codes to indicate the branches of industry where the products are used. Unfortunately, the European Chemicals Bureau (ECB) does not use the same system, which makes analyses linking data from different sources more complicated and less useful. All the Nordic registers report to SPIN using NACE at the 2-digit level. When the number of products allow it Denmark and Sweden also report to SPIN in more detailed national codes based on NACE. The Danish register use the Danish Industrial Classification of All Economic Activities from Statistics Denmark. It is a 6-digit subdivision of NACE with 2 leading characters designating the main groups of NACE. Swedish Industrial codes have their origin in NACE codes by the adoption of Standard Industrial Classification; SIC 92 into SE-SIC 92, Swedish Standard Industrial Classification. This classification is used by Statistics Sweden for official statistics. A selection of those codes has been used as codes for reporting industrial category to the products register since 1992. Those industrial categories cover all economic activities in Sweden to a different level for different categories. It was considered more important with high resolutions, more detailed coding, for report of the economic activities dealing for the most part with chemicals than for others less related to such. This means that some economic activities are reported only with their NACE section, one level only, to the register whereas some are reported to the level with section and five digits. In Denmark, the function of a substance in a product has been evaluated and registered by the product register. In Norway, the companies submitting declarations provide such data on a voluntary basis. Stating of the function of a substance is in Sweden only done when the substance is intended to act as a preservative in the product. For the moment, data regarding function of substances in products and preparations are only included in SPIN based on data from the Danish Product Register. Except for the systematic checking of classification information done by the Finnish product register, none of the Nordic product registers has systematic routines for checking whether the data submitted by the companies are correct. However, data on quantities may be checked in connection with the annual update in Norway and Sweden. For example, information may be checked if disagreements with previously reported figures are found. In Norway and Sweden, companies are also required to check various types of information when they submit their annual updates. In Norway, this applies to whether the danger categories recorded are correct, and whether the composition of the product has been changed. In the Norwegian and Swedish product registers, the quantities, the classification, the codes for areas of use and the codes for product types are updated every year, and trends can therefore be followed for both substances and products. In Finland only the quantities are updated each year. In Denmark only the quantities are updated every second year. For all the Registers updating of the other information given by the company at registration like composition and physical properties is supposed to happen whenever these conditions are altered. The SPIN database is updated on a yearly basis making the assumption, that data delivered from each register are as updated as they can be. Of the Nordic countries, only Denmark and Norway require information on all constituents for most products for which declaration is mandatory. Denmark has complete information on composition for the largest number of products. In Sweden, substances that are not classified as dangerous and that make up less than 5 per cent of a product may be omitted from the declaration. In Finland, information on the composition of products is registered from the safety data sheets. Complete information on the exact composition is consequently not necessarily given.